I'm made another card using this sweet die-cut of trees from Memory Box. I love this die. So easy to place a colourful background and stamp a sentiment. 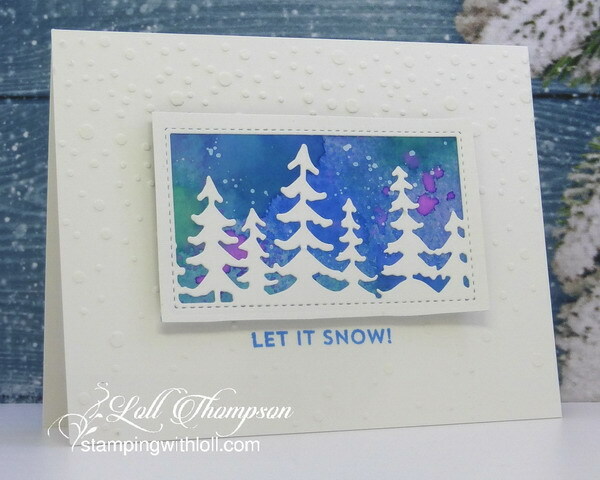 This time I went one step farther and stenciled "falling snow" with white embossing paste. I first placed my tree panel over my card base to get the positioning and stamped my sentiment (in blue). Removed the panel, placed a piece of temporary tape over the sentiment as a mask and then stenciled with embossing paste over the front of the card. Used diluted white acrylic paint to splatter some falling snow on the tree panel. Once the embossing paste was dry, removed the mask and adhered the tree panel, popping it up for extra dimension. I hope you'll come play along at Rudolph Days. Really super card with a gorgeous background behind the trees and the EF looks great. I LOVE your pretty background with the snow splatters. So pretty behind your trees die cut image. Love your falling snow stenciled EB paste background too. I need to add your die cut and stencil to my wishlist:-) TFS my friend. Hugs.. If I had not read your description I would have thought the base was dry embossed. How cool this looks! Your sprayed background turned out beautifully and once again you combined colors I would never have dreamed to put together. The stark white die cut trees are so perfect with this. I spy a card to case! I love this die too and your background is perfect for it! 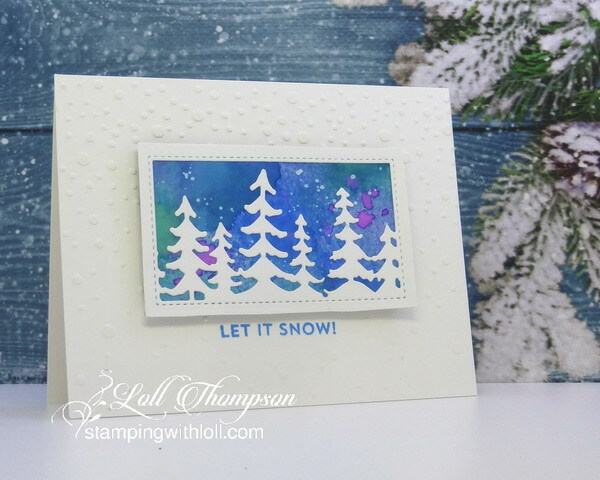 Love the spattered snow and the stenciled snow on the card base! This is a beautiful card, Loll. I love the back ground and the white trees look so peace3ful against the falling snow! A fabulous card - I love the sky background you have created. Hi Loll, Love the card and always love to read how you created it! The effect of falling snow is a beautiful touch! A perfect winter scene. Thank you for leaving such a sweet comment on my Christmas challenge post, and the kind comments about hubby. We look forward to a bit better year for him once we get (last years treatment) check-up appointments over with. Such a pretty winter look! Easy peasy????? wish it would be for me LOL. LOVE this card. This is a lovely card!! made perfect by the sky you created Loll and the falling snow was the perfect touch!! This is such a beautiful Loll card! I love how you raised the colored panel on the distance foam. Your image looks like a TV :-) I love your wonderful background and the outline of Christmas trees. And adding the embossing paste on the card panel looks stunning. WOW! I love this card! What beautiful colours in the sky! Love the embossed, stenciled background too! Isn't that die just the best? Easy peasy maybe Loll, but absolutely stunning with it! OOh so gorgeous the background you created is. Love those trees. Such a fabulous card Thank you so much for joining us at the Rudolph Days Challenge! Just perfect!!! Love this! The addition of the embossed panel is just exactly right! Your watercoloring on your background is so pretty, Loll! I love your choice of colors and that you kept your design CAS! I can see why you love this die so much...it's perfect on your card!